Curate is a popular word these days. Until a few years ago, I really only ever heard it used in regard to a curated collection in a museum or maybe a haute couture clothing line. But then again, I live in a bubble. Perhaps you’ve been curating this, that, and the other for years. One thing I know from doing five minutes of googling is that museum curators get REALLY irritated when plain old people like yours truly dumb-down the word to include what we put on our Pinterest boards. Last year when we began to declutter/minimize our belongings, the word curate popped up in a lot of books and articles and blogs and podcasts that I enjoyed. At some point about this time last year I wrote this question in my journal: “How does one curate a wonderful life?” On the following page of the journal I wrote out the numbers 1 through 240. That would be the number of days I had (have) to work from July 1, 2017 through June 30, 2018. Apparently, I intended to mark off the days as they passed, which I did not. I don’t see the word “curate” again in my journal, probably because to curate a wonderful life is SOME kind of tall order, but I am going to start a list right now to try to define what a wonderful life even MEANS to me. I’ll share it with you sometime soon. Do you know what it means to you? Still, I just like to say “curate” and by golly, I am going to CURATE something. We have begun the building process of our new home in a very intentional way. When we clean out all of the boxes in our storage units…yes, more than one storage unit…we are NOT bringing in the six boxes of crystal doodads left to us by Aunt Bubbles…YES, I did say that we started to declutter/minimize last year, I did NOT say that we finished. We have cleaned out the homes of four people in the last ten years. There are a lot of doodads. We are downsizing. We want our home to feel warm and welcoming. We want to feed people. We want family and friends to visit our home and leave feeling renewed and relaxed and loved. We want to make smart decisions throughout the process. We are not going to put a thing in this house that we don’t both really like a whole lot. Thus, I hereby declare that I am, with the wisdom of an expert, the marvelous Missy LeCroy Orr from LeCroy Interiors in Greenville, going to CURATE our new home. 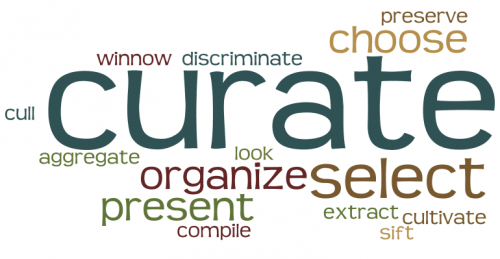 Curate: Definition by Daughter of the South (because this is my blog and I can do what I want): To organize, plan, and collect for the purposes of creating a warm, welcoming and loving environment/climate in our new home.